Staring into the sweet abyss. My Dad wore snazzy plaid pants in the ’70s. 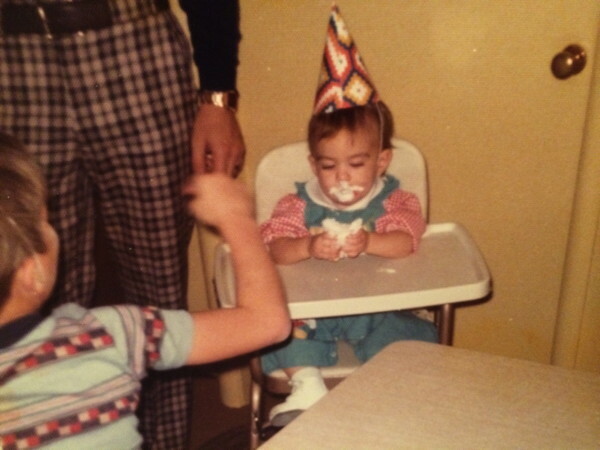 I’m not sure if it’s genuine or not, but I believe that my first memory is of my first birthday. It involves cake. This would surprise absolutely no one who knows me at all, so it seems like an efficient way of introducing myself. I remember a small cake shaped like a rabbit — brought by someone, I believe my grandmother, just for me. It was adorable, frosted white, the perfect first cake for a baby. However, across the room, I spotted a much larger cake for everyone else. I wanted that other cake. Quickly deciding that if I could eat that little rabbit cake fast enough, I would get a crack at the larger cake, I shoved as much of the rabbit cake into my mouth as I could. However, I quickly realized that not only had I ruined my sweet rabbit cake, but that I had literally bitten off more than I could chew. Cake poured back out of my mouth as I gulped and swallowed, trying to free myself from a suffocating amount of sugary goodness. I never got to try the other cake. My name is Elisabeth. I’m 39, married for two years to an incredible guy, and about nine months pregnant with our daughter. I’m also the very lucky stepmother to our nine-year-old son. My husband and I both work in comics. I’m obsessed with cooking, celebrity gossip, and Murder, She Wrote. I’m a semi-reformed slob, a control freak, and a terrible photographer. I can’t bear it if anyone other than me cuts a cake. Oh! And Kraft Macaroni and Cheese is my life. That’s probably enough for now. You’re regretting reading this, aren’t you? Super-Cool Disclaimer: Elisabeth Allie an employee of Things From Another World. The opinions expressed here belong solely to her and do not necessarily reflect the views of TFAW, its officers, shareholders, or other employees.